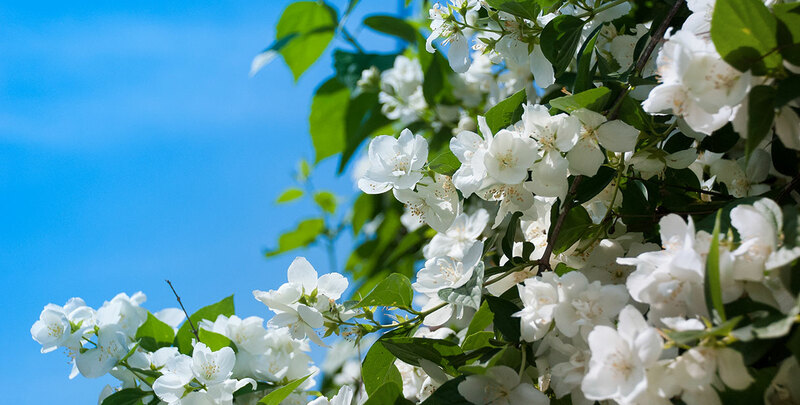 The mock orange, also known by its botanical name philadelphus, is a deciduous shrub mainly appreciated for its scented blossoms, which appear in the late spring, when its buds unfurl around June or July. The name “mock orange” refers to these blossoms, which are easily mistaken for orange or lemon blossoms due to their appearance and their jasmine- or orange-like scent. They are not closely related to any of these species, however, and form an entirely separate genus. The cultivar ‘Virginal’ is by far the most popular philadelphus variety among gardeners, as it forms a tall, large, vigorous and very fragrant hedge. 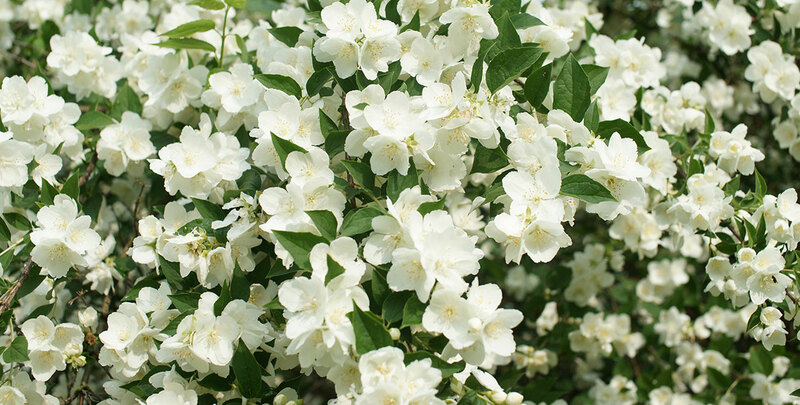 Simply put: a mock orange hedge is a hedge that will not only look beautiful, it will also smell great. A mock orange can easily be recognised by its oval, dark green leaves. Due to its relatively large growth habit, the species makes excellent informal hedges that are especially suited for larger gardens. As a result, it is necessary to prune a mock orange hedge annually, since they will grow out of control otherwise. On the other hand, mock oranges are exceptionally strong hedging plants, which can deal with urban pollution and are resistant to the diseases that affect many other hedging plants. This makes the mock orange an attractive hedging plant: while it does take some effort to maintain a mock orange hedge, your effort will be rewarded by having a tough, strong and elegant hedge in your garden. Its botanical name may bring the American city of Philadelphia to mind, but there is no relation between those names. The name of the philadelphus genus refers to Ptolemy II Philadelphus, who reigned over Egypt about two and a half decades before the Common Era. This Egyptian king was reportedly fond of fragrant flowers, though it is unlikely that he ever smelled the pleasant fragrance of the mock orange, as it is generally assumed that the species is native to the mountains of Central Europe. 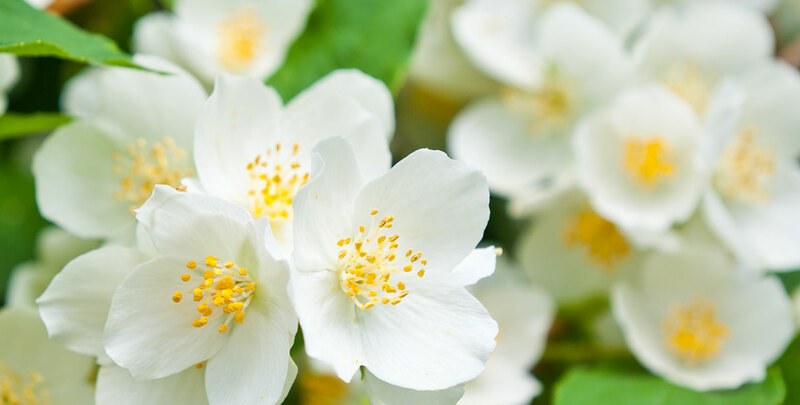 Despite originating from a region relatively close to us, its blossoms give the mock orange a somewhat exotic character, which is why it is highly sought after by people looking for a hedge with a more foreign appearance. Often, the mock orange is used as a component of a mixed hedge, but the philadelphus ‘Virginal’ is beautiful enough to be used as a single species hedge. Mock orange hedges are also very friendly to wildlife, as their nectar is irresistible to pollinating insects, such as bees and butterflies, and its growth habit allows birds to hide from predators among its branches. Keep in mind that mock orange hedges do not make good privacy hedges due to their relatively open character and, of course, the fact that it loses its leaves in the autumn. While the wood of philadelphus species is not very commonly used, it is fairly easily hollowed out and therefore sometimes used to produce pipes. 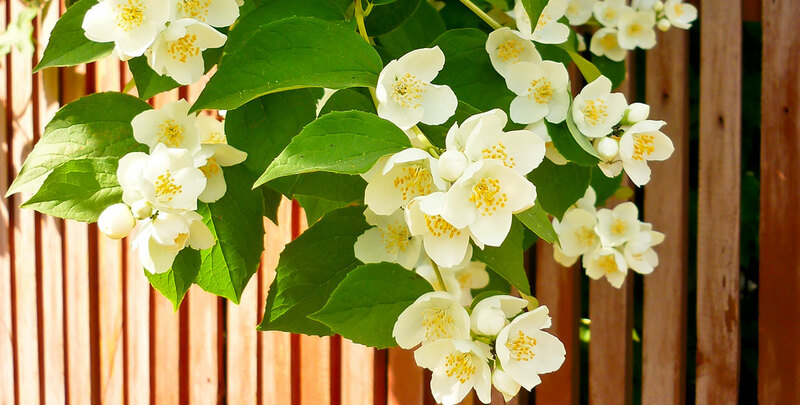 Mock orange hedges are ideally planted in a position in the full sun or semi-shade. They are not too picky when it comes to soil types, but they should not sit too wet. In fact, mock orange can handle very dry soils remarkably well. Unlike some other flowering hedging plants, the mock orange is a relatively easily maintained and versatile hedging plant that can deal with heavy clay soils and loose sand alike. While the species does prefer a fertile soil, planting your mock orange hedge in a poor soil should not cause any problems. This philadelphus variety is fully hardy and resistant to diseases. It can cope with prolonged dry periods, salt-laden coastal air and even urban pollution. This would make a mock orange an ideal hedging plant for urban gardens, but city gardens are usually relatively small and a mock orange will take up far too much space in a small garden, as a mock orange hedge requires a lot of room to grow. They have a relatively fast growth rate of 30 to 40 centimetres per year and reach an ultimate height of 2 to 3 metres within 5 to 10 years, depending somewhat on the conditions. Because of this, it is necessary to prune your mock orange hedge on a yearly basis. Pruning is preferably carried out in the late summer after the mock orange has finished flowering. If you spot new shoots, we recommend you cut them back by a quarter or even half, so your mock orange hedge will retain its beautiful shape. If you are looking for a hedging plant that will add plenty of character to a fairly sizeable garden, the mock orange will suit you perfectly. It is not the easiest hedging plant to grow or maintain, but it is easy to forget that once you see the beautiful hedge that you will eventually be rewarded with. In addition, it can handle several conditions that would normally bring a hedging plant down, so we can rightfully conclude that the mock orange is an amazing combination of strength and beauty. In addition, the pleasant scent of its flowers makes your mock orange hedge a delight for not one, but two senses. However, as much beauty as its white flowers and its elegant, dark green leaves add to your garden, a mock orange hedge will also attract wildlife and make your garden look even livelier as a result. A philadelphus hedge will certainly make your garden stand out. Even if you choose to use it as a component of a mixed hedge.